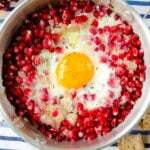 Pomegranate with Eggs is the first recipe I’ve tried from my lovely fellow blogger’s cookbook Pomegranates&Saffron A Culinary Journey to Azerbaijan. Feride is one of the food bloggers I met when I started blogging five years ago. 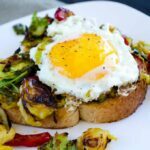 I admired her amazing blog Az Cookbook at first sight. Her Easy Baklava recipe just hooked me and I spent long hours watching her beautiful photography and fantastic looking dishesi, and soon became one of her fans. As expected from most of successful food bloggers, she has her own cookbook now. I’ve never met her in person, but I know she worked really hard on it. She says that it took 7 years for her to write it. And you know what? She sent me a copy! Thanks a million Feride! The book has impressed all family members and everyone has made a list of recipes to try. I wanted to start with something with pomegranates. Did you know this wonderful fruit has a significant role in Azerbaijani cuisine? Feride says that it is their national fruit and used extensively in traditional cuisine. In October they have pomegranate festival in the region of Goychay in Azerbaijan. Do you find it hard to seed pomegranates? She shares an incredibly easy and mess-free method to do it. No, please don’t ask me how. You can still order Pomegranates&Saffron and in addition to this local method of cutting open pomegranate, you can learn more about one of the tastiest cuisines around the world. I’m very lucky to receive the book in this season. Otherwise, I will have to wait for a long time to try recipes that require pomegranates. Our little gourmet’s favorite fruit so far is pomegranates, so I thought he would like the first recipe I’d try. And I decided to try her Pomegranate with Eggs. I was just intrigued by the name since I hadn’t tried such a combination before. As I can eat anything with fried egg, I knew it would be yummy. Although the ingredients are not new to me at all, I was quite curious about the taste. The result was scrumptious! The pomegranates I used were really tangy and they had a perfect balance with sweet onions. I made it in individual portions and we all loved it! It is a great alternative to our menemen, scrambled eggs with tomatoes, green peppers and garlic. Very easy too! Who doesn’t love such easy, tasty and healthy recipes? She noted that the layer of pomegranate arils in the pan should not be thin but should be rather dense and thick. Pomegranate with Eggs is a great recipe to eat lots of pomegranates at a time, so I will definitely be making it often this immune system booster recipe! An amazing and healthy combination of pomegranate, onion and egg. Heat the butter in a medium nonstick frying pano ver medium heat. Add the onion and cook, stirring frequently, until light golden, about 10 minutes. Add the pomegranate arils, cover and cook over medium-low heat, stirring occasionally, until the arils have released some of their juices, about 10 minutes. Break the eggs one by one into the pan, spacing them evenly and making sure the yolks stay intact. Season with salt and pepper to taste. Cook until the egg whites are set and the yolks are set on the top anda re somewhat soft in the middle, about 5 minutes. Remove from the heat and serve immediately with bread. I made it individual portions, so shared the ingredients into small pans. You can do the same or just use a large skillet and cook them all together. We also make this in Persian cuisine, it’s lovely! I will look for her cookbook as any cookbook with beautiful photos is a must and your site is full of inspiring recipes! This is a unique flavour and so easy t make and fast ! I tried it and it was too good. I never cook and never ever have eggs as the raw egg smell turns me away. But this one actually had me eating egg and I loved it. I am from India and will let my friends know about this wonderful recipe ! What an interesting recipe! And I just happen to have one last pomegranate in the fruit bowl! 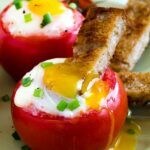 I have never thought to try pomegranate in eggs…looks good! This is super pretty to look at. I would never think to combine a pomegranite with eggs. We have a dozen or so pomegranite bushes on our place. I might have to try this with one of the fruits. Thank you so much, Zerrin! What a surprise! I am glad you enjoyed the recipe. Your photos are absolutely gorgeous. Made me want to rush into the kitchen and make pomegranate with eggs again:) So beautiful! Thank you once again. Lots of hugs from Los Angeles.